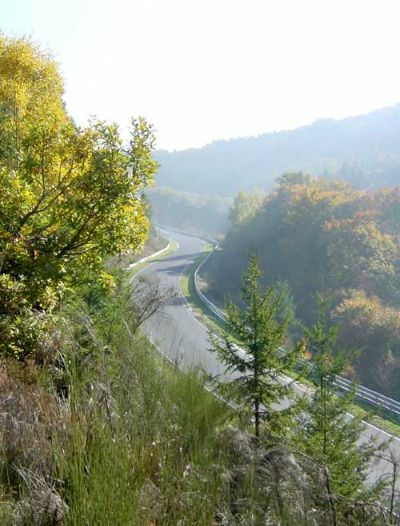 This very fast uphill section leads from Bergwerk to the Steilstreicke (test hill) and will make your Caterham feel underpowered. Aerodynamics kick in at these 3 figure speeds and GT3's will fly past you! 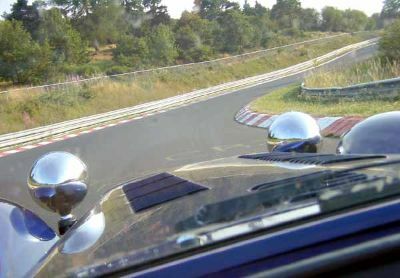 In a Caterham it is almost all flat out. 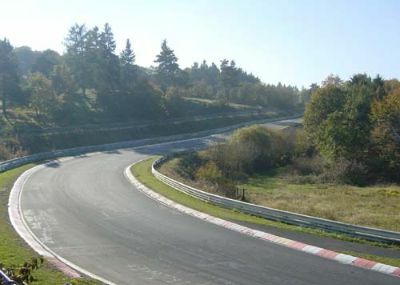 The flat out left kink between Exmuhle and Bergwerk is unofficially known as Lauda-Linkskinck, as it is here that he suffered his fiery accident in the 1976 German GP. 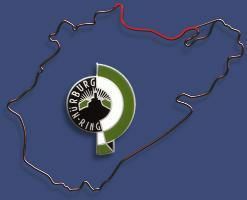 Access to this part of the circuit is from a road that turns right, up a valley just before Adenau, as shown on the second map on the previous page. 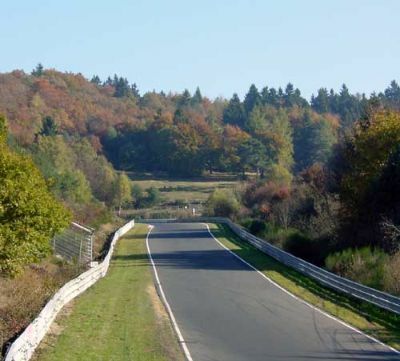 After a short ride or walk up the road, you turn off down a track which brings you back to the track at Bergwerk. Reverse shot looking back towards the first part of Bergwerk. 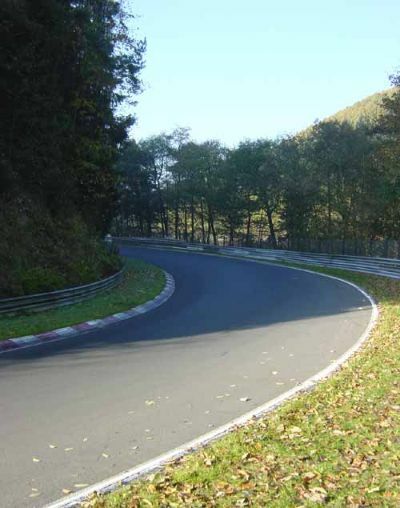 This corner is considered very important to a quick lap of the Ring as it leads directly onto the very fast long uphill slog towards the Steilstreck and the Karussell. The exit, or rather mid-corner, of Bergwerk. The corner can often be damp as it is sheltered by trees and often in shadow. 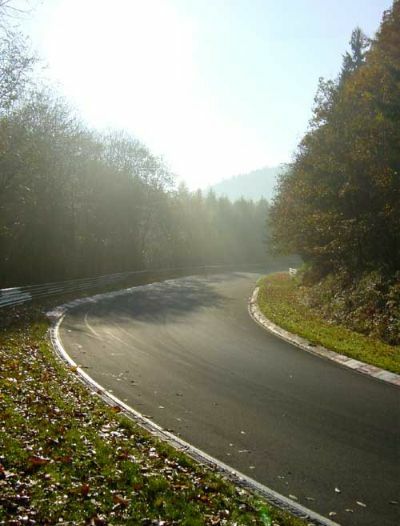 With the sun's rays breaking through the leaves and morning mist, and a silver slither of track dissapearing around a blind bend I think this shot captures some of the Nordschleife atmosphere perfectly. Our bike path then crossed to the opposite side of the small valley as we travelled up hill towards the Kesselchen section of the circuit. 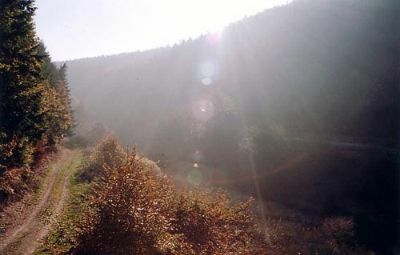 The track is behind the trees on the right. 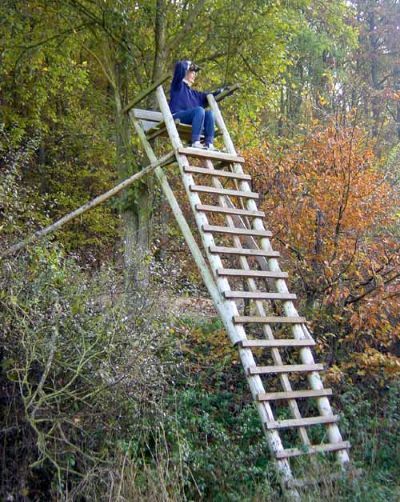 Throughout this area there were lookout ladders like this one. 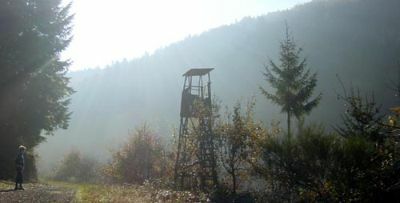 I am not sure if these are firewatch lookouts, places to climb and watch the track, or wild life viewing platforms - there are a lot of eagles here! Track is just about visible across the field through the morning sun. 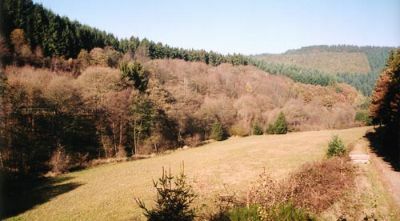 View from the tower looking back down the valley towards the exit of Bergwerk. Beautiful. We did not meet a single person on our bike ride until we reached the popular car park/spectator area of Brunnchen. If you do intend to walk or ride around the track take supplies. Assuming you start as Adenau as we did, you will not come across any sort of shop for supplies until you reach the petrol station at Dottingher-Hohe. 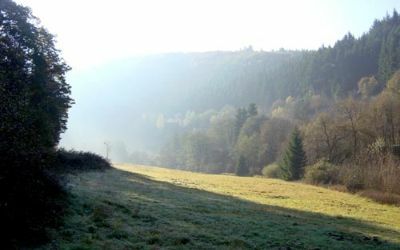 You can see our bike track start to climb off towards Steilstreick - the track doing the same on the opposite side of the valley. At this point the path rises some way above the circuit. 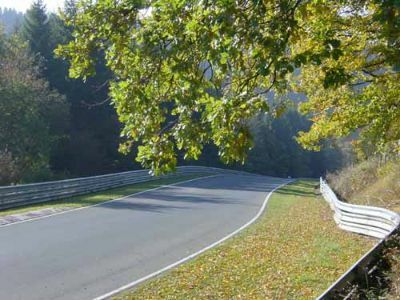 Part of the Kesselchen complex of bends is below. You get some idea of how steep the track gradient actually is. When you are driving the track you know it is uphill, but only when you are next to the track do you realise just how steep the hill actually is. No wonder the car seems to run out of steam! Reverse shot looking back towards Kesselchen 2. Now back at track level the climb of the track is even more pronounced. 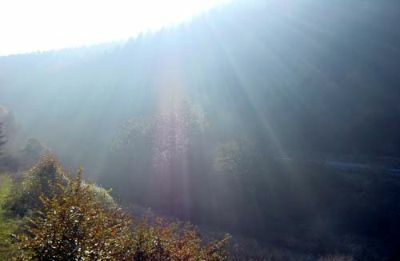 I think I am standing at the start of Klostertal. Another reverse shot looking back towards Klostertal. These sweeping corners flow nicely and are all pretty much flat out in our little car. Almost there! Now looking up the track from Klostertal you can see that a final slight crest hides the curves that lead up to Steilstrecken-Kurve, the right hander that then leads up towards the Karussell. Reverse shot looking back towards the final part of the long uphill sweeping stretch. 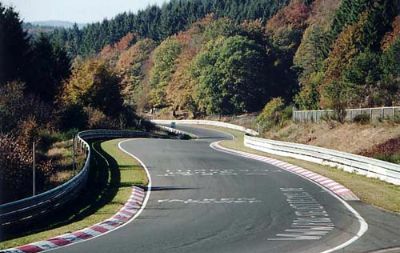 This shot also shows the rippling or the surface that some corners at the Ring suffer from - a nightmare for a biker off-line! Steilstrecken-Kurve turns right uphill and leads onto the steep blast up to the Karussell. Car gripped really well here and I felt the grip was superb - a real slingshot of a corner! Steilstrecken-Kurve. Enter from right and exit uphill towards the Karussell, left. Sweeping through Steilstrecken-Kurve in the car. Our Audi friends returning (driving the wrong way around the track!!) down from the Karussell, before coming back again for another go. What a place to learn to track drive! 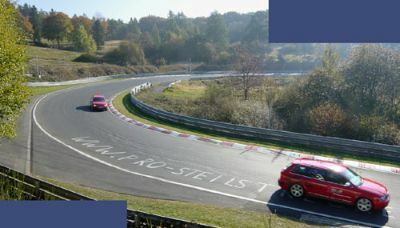 In the picture above you can see that the tarmac seems to head off to the left as the track curves off uphill to the right. 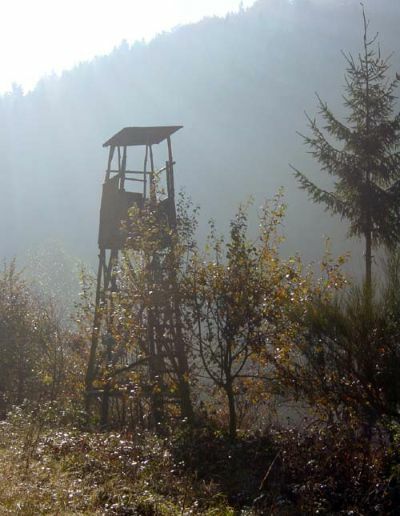 This little detour leads to the base of the Steilstrecke - or 'Test Hill'. This very steep incline was used by manufacturers to test power figures, but is rarely used now.